A History of "The Little White Church on the Hill"
At the 1863 annual meeting of St. Paul's Parish, Point Douglas (both of which are now long gone), a vote was taken to establish St. Mary's Church. Basswood Grove residents William Allibone, John Allibone, William Stokesbery, Jr., Thomas Wright, Mark Wright, Sr., Mark Wright Jr., and John Wright signed the request to the Vestry. It was unanimously approved Easter Tuesday. The First Bishop of Minnesota, Henry Benjamin Whipple, ratified the founding of St. Mary's saying: "I hereby give my consent to the organization of a parish in communion with the Protestant Episcopal Church in Basswood Grove, Minnesota." The date of the permission was April 16, 1863, in the middle of the Civil War. Bishop Whipple, famous in Minnesota history for both his shepherding of the diocese and his work with the Native American peoples, is pictured at left. In fact, Whipple convinced President Lincoln to alter federal policy towards Native Americans in general and the Dakota (or "Sioux") in particular. He was known among the Dakota and Ojibwe peoples as "Straight Tongue" for his consistent honesty. Bishop Whipple confirmed the first class of confirmands at St. Mary's. St. Mary's fledgling congregation gathered for worship in the local schoolhouse. On May 14, 1863, the newly formed Vestry approved the purchase of 2.5 acres of land that belonged to Samuel Van Alstine. 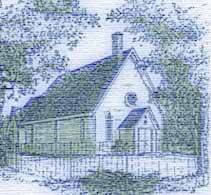 The Vestry also resolved to build a church 24 feet by 30 feet with a chancel 10 feet by 12 feet. Bishop Whipple laid the cornerstone for the church building in May of the following year. Guy Perkins and Samuel Van Alstine constructed the building which is still in use today. At a meeting of the Washington County Historical Society, Lou Orr, a member of St. Mary's for all of his 65 years, regaled his audience with stories of some of the early parishioners who came to church services wearing home-made straw hats and in their bare feet with trousers rolled up almost to their knees. In the image at right, the confirmation record from 1882 records that the Perkins, Wright and Cran families were well represented. The register also includes a charming note from the Rev. J. W. Barker who became Priest-in-Charge at St. Mary's in 1903. It reads, "Rev. J.W. Barker, D.D., rector of St. Luke's parish, Hastings, became priest in charge of St. Mary's mission, in Bass Wood Grove in Aug. 1903, holding services twice each month, summer and winter, when weather conditions would permit the people to attend, ending his ministry there on ____." The register does not include the end point of his tenure, and the 1964 centennial history of St. Mary's does not mention him at all. The listing of clergy has gaps in it, perhaps as we are not always able to distinguish between more permanent appointments and clergy who served only temporarily. Not all the early years were happy. 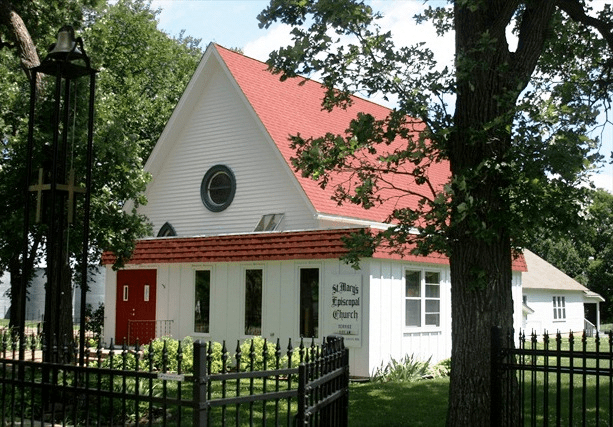 Some time after the founding of St. Mary's, a group split away and founded its own church down the road--the United Brethren Church. The late nineteenth-century was a time of considerable anti-Roman Catholic feeling and sometimes the Episcopal Church was thought to be "too Catholic," though much of the reason for the split has been lost to history. The United Brethren Church did not survive but the breakaway members were not allowed burial in St. Mary's cemetery. They founded their own cemetery which still exists. In the early years, the wagon trail that became St. Croix Trail, and which led from Afton to Prescott, Wisconsin in the south, was very busy. To sustain the small church next to the Trail in the early--and often lean--years, the women of the church would hold bake sales, dinners, and, in the fall, harvest festivals in farm homes around the area. There were activities such as quilting bees, taffy pulls, dances, and bobbing for apples in dangerously large barrels filled to the brim with St. Croix River water. Echoes of these pioneer events can still be heard at St. Mary's Annual Corn Roast and Silent Auction held in mid-August. Of course, there were births and baptisms and the church grew in the early years. Some Sundays, entire pews would be occupied by a single family. The Crans and Orrs have seen five generations attending St. Mary's. Much later, one memorable Sunday saw the seven children of Mr. and Mrs. Lauren Herman baptized. Descendants of the Herman family still operate the farm across the road from the church. Sixty years after the construction of the church, on Dec. 20, 1925, plans were approved for the construction of a Guild Hall behind the church. Another Van Alstine was involved, this time William Van Alstine. Also on the committee were Mrs. Shingledecker, Mrs. Siebolds, E.B. Hetherington, and Mr. Orr. The Guild Hall was constructed on the parcel of land that was formerly occupied by the horse and carriage shed. Work was completed in 1929, at a cost of a little over two thousand dollars. The carpenter was Theodore Siebolds; lumber from an old shelter for horses was used in its construction. As a result, the Guild Hall came into being--and is still in use today. There were lean days when no priest served the church. In such days, lay members filled in and led morning prayer. 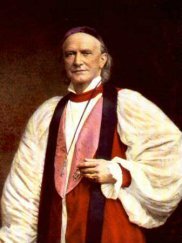 One prominent lay leader was Dr. Norman Johnson, a physician from Minneapolis whose father happened to have been an Episcopal bishop. Walter Mills, a member since his childhood in the 20s, recalled in 2001 the stories coming from Dr. Johnson's faithful service. When it was not possible to hold Sunday morning services, they were held at night. But through it all, thin and thick, the little white church on the hill survived as a beacon of Christian hope. In 1927, the church resolved to incorporate a cemetery association in order to handle the affairs of the cemetery. The committee was comprised of L.W. Orr, Mr. Mills, and Mr. Oldham. On September 30, 1930, almost a year after the great stock market crash, Mr. Oldham was elected chair of the cemetery association while E.B. Hetherington retained cemetery records. The task of the association is to allocate space and make sure that the cemetery is maintained in good condition. Owners of individual plots incur the responsibility to maintain markers. Some people buried in the cemetery were born during the Revolutionary War. A Memorial Garden was incorporated into the cemetery in 1999. It has been used for worship services and is a lovely setting for those who wish to meditate in this beautiful environment, where those who have gone before provide their enduring witness to the Christian faith. In 1962, a red carpet was installed in the church, while roughly at the same time a new furnace was installed. Milton Orr was the benefactor covering a large part of this cost. In 1964, the stage was removed from the Guild Hall. For many years, the church was left open for all to visit and offer prayers. Like most churches, however, that practice has been abandoned--but a key is generally available across the street at the Herman farm for those who wish to spend some time in the "Little White Church on the Hill." In 1964, the church was lifted from its original foundation and a full basement was constructed. In 1972, the Narthex was added to the front of the church. It provides better access to the Undercroft and space for parishioners to gather before and after church. In 1983, the old outhouses were given a respectable Christian burial, their mission literally fulfilled. A news story in the Oct. 4, 1964 edition of the St. Paul Pioneer Press by Gareth Hiebert featured St. Mary's. The title for the article was "Little White Church Celebrates Century of Service Today." 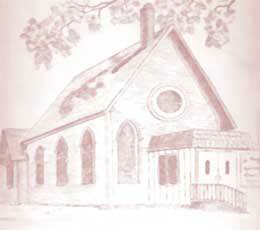 Mr. Hiebert wrote that "St. Mary's is much as it was on Oct. 3, 1864, when it enclosed the first service. The heavy, carved rolled back pews, the altar railing, the wainscoting along the walls, the beamed arches--just as they were." "Our gracious Heavenly Father, we come before Thee with thankful hearts for the many blessings which we have received. We thank Thee for the heritage of freedom which is ours because of the dreams and wisdom of our founding fathers and the courage of our pioneer women. Give us strength and understanding to guard our heritage so that their trials and sacrifices will not have been in vain. Guide us and direct us, the congregation of St. Mary's Episcopal Church, to be faithful to our tasks so that our high hopes for the future of our church may be fulfilled." The founders of St. Mary's probably would not have guessed that it would be around more than five generations later or that a history about their times would appear on something called an "Internet." Then again, given the prayer above, the Twenty-First Century may at some point be viewed as the early days of St. Mary's history. That is our prayer today. The pews cost a grand total of $148.00, which, of course, was a considerable sum when they were purchased in 1878. 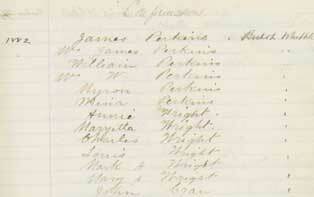 On April 5, 1878, John Burton, George Holt, Mark Wright and Simon Fetterly drove to Minneapolis for the church pews. It took three loads to get them and they were packed, according to church records, in hay for the return trip! The original church windows, which are now over the altar and at the rear of the church, were purchased in 1864 at a cost of $189.00. The window in the south chancel is in memory of Arthur Chard who served for twenty-five years (1907-1932) as the parish priest. The side windows commemorate the Wright, Gallinger, Davies, Orr and Hetherington families. At the rear of the church is a window in memory of the Rev. Timothy Wilcoxson, the first priest of the parish. The round window over the main door was very carefully selected and is the finest window in the church. It was placed there by the Rev. William P. Anna, who served the church during the depths of the depression, 1932-1937. The two wooden crosses on either side of the altar were carved from black walnut trees from Lou Louden's farm, and the stunning Crucifix above the door at the rear of the church was carved by William Schurmier. This history is a work in progress. Additional items of historical interest should be sent to St. Mary's. Special thanks go to Jim Cran, a life-long member of the parish, and Ms. Sandy Berglund of the Afton Historical Society Museum, as well as to all the "crew" at the museum, for their assistance in compiling this history. One Response to "Parish History"